The project has started on April 1, 2015. Strengthening food and nutrition security (FNS) in the EU requires sustainable food consumption and production. To gauge the policy reforms needed for this major societal challenge, the SUSFANS-consortium will identify how food production and nutritional health in the EU can be aligned. The multidisciplinary research agenda of SUSFANS will build the conceptual framework, the evidence base and analytical tools for underpinning EU-wide food policies with respect to their impact on consumer diet and their implications for nutrition and public health, the environment, the competitiveness of the EU agri-food sectors, and global FNS. 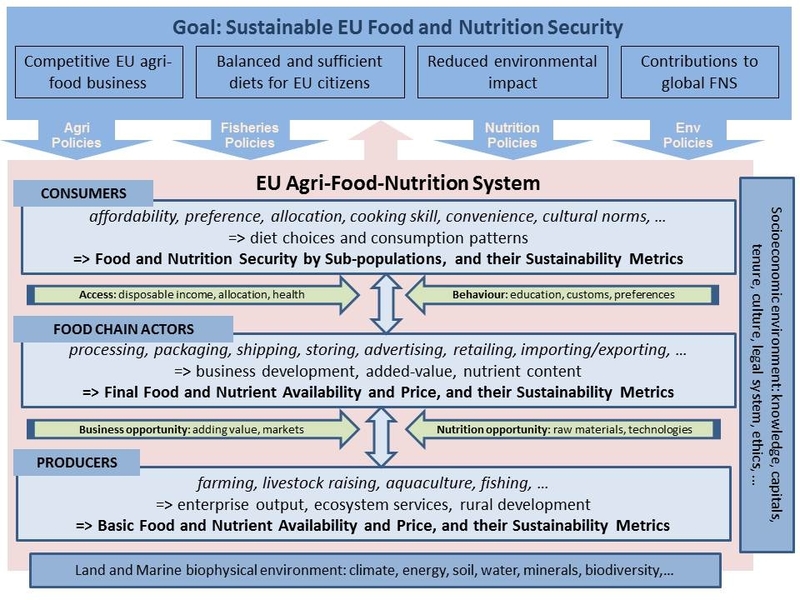 Based on a conceptual model of the food chain and its stakeholders, SUSFANS will develop suitable metrics and identify major drivers for sustainable FNS, integrate data and modelling, and develop foresight for European sustainable FNS. macro-level modelling of food demand and supply in the context of economic, environmental and demographic changes on various time-scales and for multiple sub-regions. The tools will bridge the current gap between policy analysis on the EU agri-food sector and the nutrition-health sector. Case studies and scenarios based on stakeholder input from consumers, food industry, farmers/fishermen, government and the scientific community, are instrumental in achieving this goal. The project will provide a comprehensive assessment of FNS in Europe, centred around the implications of the current diet for the sustainability of production and consumption in the EU, and the options for the EU agri-food sector (including fisheries and aquaculture) to improve future diets in the near future (up to 5 years) and in the long run (one or more decades ahead). We act as work package leader for WP4, Thomas Heckelei additionally serves as leader of Pillar II "Modelling sustainable food and nutrition security". Methodologically, we will employ econometric analysis and further develop and apply the CAPRI modelling system.